Infiniti QX30 Review 2019 | What Car? The Infiniti QX30 is a small, upmarket SUV produced by Nissan’s premium brand. It’s only available with a 2.1-litre diesel engine, a seven-speed automatic, and four-wheel drive. It’s competitively priced against similarly high-spec rivals like the Audi Q3, Mercedes GLA, BMW X1 and Range Rover Evoque. The combination of the diesel engine and automatic transmission generally works well, but the gearbox can occasionally be slow to change down or up. The QX30 is softly set up, too, and leans quite a lot in bends, and its steering is quite heavy; it certainly doesn't handle as well as most of its rivals. On top of that, visibility is poor and the rear space is very cramped. 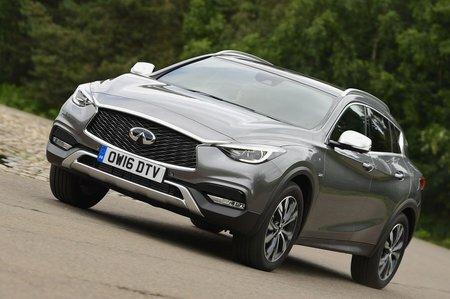 The lower-priced Premium trim is well equipped and is the better buy of the two, but there's a question mark over the QX30's future residual values - it certainly won't hold on to its value as well as its upmarket rivals from Audi and BMW. However, it rides well, and it's quiet once on the move. It’s just a shame that lower-powered and cheaper front-wheel drive models are not offered, and its cramped rear passenger space means it’s not very practical by any normal SUV standard.